Equity funds continued to dominate the retail wallet share. While 73% of retail assets under management (AUM) was in equity funds in December 2014, it went up marginally to 74% in December 2015, according to a data analysis by Prime Database, which focuses on retail investors. However, according to Pranav Haldea, managing director, Prime Database, the picture is different for high net worth individuals (HNIs). As of December 2015, equity funds comprised only 38% of HNIs’ wallet share (though up from 34% a year back). 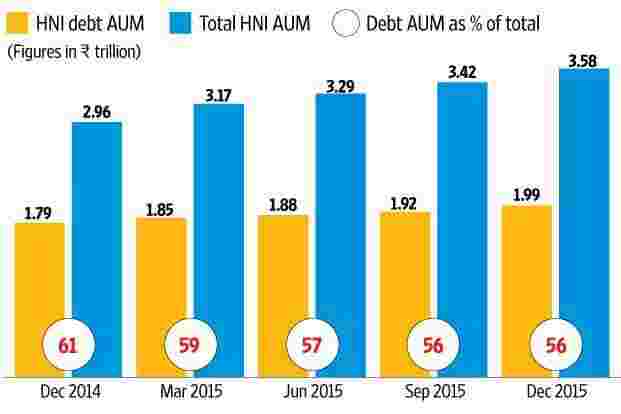 Highest allocation of HNI monies is into debt, though this has fallen from 61% in December 2014 to 56% in December 2015. 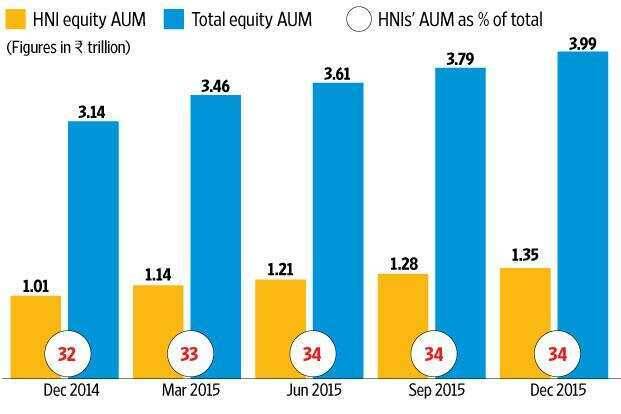 Despite market volatility in 2015, retail participation through equity mutual funds has seen a huge fillip. This went up by 17% from ₹ 1.68 trillion in December 2014 to ₹ 1.96 trillion in December 2015. Significantly, their contribution to the total equity AUM went down from 54% a year back to 49%. On the other hand, for HNIs, not only did the equity AUM increase by 33% from ₹ 1.01 trillion to ₹ 1.35 trillion, their contribution to the overall equity AUM also increased from 32% to 34%. Most investors, however, remain to be from the bigger cities in India. 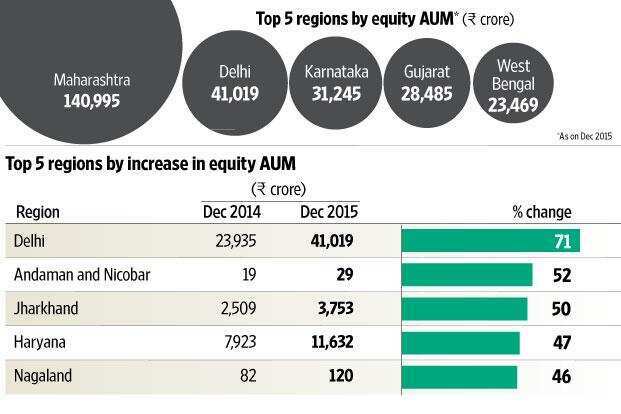 The efforts to increase the penetration of mutual funds beyond the top 15 cities do not seem to be making an impact. The share of beyond top 15 cities in retail equity AUM actually went down from 20% in December 2014 to 18% in December 2015. On an overall basis though, while the total AUM from top 15 cities went up by 20% over the past one year, the share of the beyond top 15 cities went up by a slightly lower 17%. 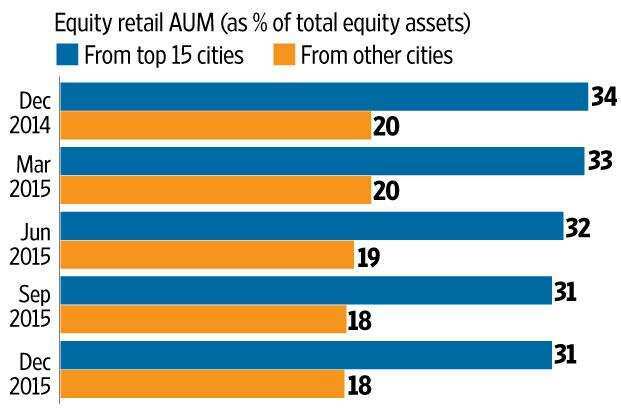 In terms of state-wise equity assets, data for retail is not separately provided by the AMCs. However, on an aggregate basis across all investor classes, Maharashtra led with 1.41 trillion, taking up 35% share of the market. Delhi followed, though far behind, with ₹ 41,019 crore and Karnataka with ₹ 31,245 crore. In terms of the annual growth (for states with an AUM of more than ₹ 1,000 crore), Delhi led with a 71% growth, followed by Jharkhand with 50% and Haryana with 47%. It is surprising to note that a huge amount of ₹ 15,392 crore of equity AUM has been reported in the ‘Others’ category, meaning the state name is not available with AMCs and they must ensure proper detail entry from the know-your-customer angle.